Can Use To Stream Netflix etc. PureVPN Ranked 3rd In Our Testing. PureVPN, a Hong Kong-based company, was established in 2006 and the proxy service provider started providing commercial services from the following year. The secure VPN service makes available a wide range of connectivity options with as many as 335+ VPN servers in 53 countries which is in the upper end of other VPN service providers. The aim of this PureVPN review is to discuss the key features offered by the service provider. PureVPN enables you to experience absolute online security through an “Internet Kill Switch”. This feature acts to kill all your internet activity the moment you disconnect. This is to say that you will be able to surf only when you are protected. The Kill Switch can also manually activated/deactivated in case you want to continue to use the internet without VPN coverage. The Switch can be accessed from PureVPN’s client software. You can activate/deactivate the Switch by checking/un-checking the “Activate Internet Kill Switch when VPN disconnects” box. In addition, the proxy service makes use of 256-bit SSL keys to encrypt your data. This high level data encryption makes it virtually impossible for hackers to steal any of your data. You can, therefore, use any credit card or online banking with the confidence that you will always remain protected. The protocols supported by the VPN service include OpenVPN, SSTP, L2TP/IPSec, PPTP and IKEv2. PureVPN ensures online security as well as privacy across all of the 5 simultaneous logins through your various devices. This means that one account can be used at the same time across 5 devices. It hosts servers located in 53 different countries to enable their customers enjoy uninterrupted connections. Though you can hide behind as many as 44,000 IP Addresses, the best thing is that you are assigned a new and unique IP address. The countries in which the servers are located include the United States, Australia, Bulgaria, United Kingdom, Brazil, Canada, Chile, Costa Rica, Egypt, China, France, Germany, Hungary, Indonesia, Hong Kong and Ireland, among many others. Another important feature provided by the proxy service provider is that you can decide as to which server you want to connect to. It also enables you to connect automatically to the best server for your specific requirement using the feature “Use Intelligence”. The options provided by this tab vary from casual web browsing to gaming. One of the problems with common proxy services is the restricted access to certain sites. Google monitors IP traffic and blocks IPs that access websites very frequently. Fortunately, you will not experience such problems with PureVPN because of the very high IP address volumes they provide. You can, therefore, easily access Facebook, Twitter, YouTube, etc. It is easy to install on your computer. As soon as you subscribe to PureVPN, you will receive an email with your login information. Installation is as simple as one click and launching it is just as simple. The usability of PureVPN is excellent as the User Interface is up there with the best and easy to navigate. It is designed for the user that is a little bit more advanced as there are many features and settings that you can utilize, this is great if you want to use them all but if you just want a straight up VPN connection and don care about all the bells and whistles then this may not be the one for you. Personally I really like the UI even though there are ads in the bottom left corner. 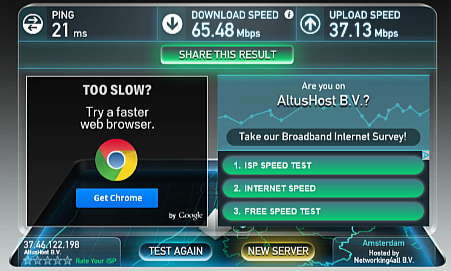 PureVPN servers provide a good standard of browsing as well as download speeds. They came in last out of the 5 VPN’s for speed but it was still at a very good standard. I did experience buffering and problems on YouTube when connecting to London but other than that it all went pretty well. Reliability is key feature offered by this VPN service provider. As a paid customer, you can enjoy a great deal of reliability and speed. You shouldn’t have to struggle with servers that are clogged up and are down most of the time. PureVPN servers are highly optimized for up to 20Mbps online HD streaming. It provides excellent range of channels for customer service. These include the live chat feature which is made available 24/7, email support and FAQ’s. You can also send tickets and participate in the forum to obtain answers to your queries. I have to say though in my testing they came in 4th out of 5 for response time and did not answer the simple question straight up but rather asked for more info which was a little annoying. One of the best features offered by PureVPN is the flexibility in terms of access. This is to say that you can use the proxy service on any device you want. It is compatible with iOS, Android, Linux, Mac, BlackBerry and Windows. In simple terms, if you can access the internet with your device, you can safely use PureVPN as well. Additionally, you can use it on five devices simultaneously. It has mobile apps for both Android and iPhone separately. Though Android is the favorite platform in the world, it is prone to internet security risks. PureVPN’s Android VPN ensures online security and bypasses internet censorship to enable access to geo-restricted websites. On the other hand, iPhone VPN allows you to get more out of your iPhone and enjoy internet without any kind of limitations. PureVPN is undoubtedly an authentic provider of VPN service at very competitive rates. The easy-to-use service offers great speed as well as ensures reliability and a host of other beneficial features to its users. The risk free trial period where you can get a refund is only 3 days for this VPN provider so you have to make up your mind reasonably quickly. If you like a lot of features and are good not technologically challenged like my mum then this is work a look.